The more I think about a Trump-Putin summit, the more I believe that it should focus on Syria. If reports this morning are true (which they likely are not), that Trump doesn’t want to run in 2020 but would rather get the job done, whatever that means, in one term, then this is absolutely the topic of highest priority between him and Putin. And up until this weekend that was simply my personal wish. There was no supporting evidence for it. Now, there may be. Over the weekend an apparent letter from the U.S. Embassy in Amman was posted by Sam Heller stating that the Syrian rebels in the deconfliction zone in Dara’a should no longer expect any support from the U.S. This letter, if real, comes at the same time as the Syrian Arab Army launched its offensive to retake the region. Most notably, we haven’t heard one peep out of Israel in protest over this, other than the boilerplate stuff about Iran not being involved. But, with Hezbollah forces on the ground there and still no airstrikes by the Israelis, I’d say that the campaign to regain the area up to the Golan Heights and the Jordanian border has everyone’s blessing. This, to me, would signal why Trump is pushing for a summit with Putin in July. No other matter is pressing in this time frame that requires the two to talk. And like Kim Jong-un’s displays of good faith ahead of his summit with Trump, Trump is giving Putin some peace of mind over Syria. It also shows that no matter how much he bloviates and thinks he sets policy in the region, Israeli Prime Minister Benjamin Netanyahu is at the mercy of both his U.S. and Russian benefactors. And this letter tells him all he needs to know about the limit of the U.S.’s support for Israeli regional ambitions. The Dara’a campaign is a perfect opportunity for both leaders to show their willingness to lead and guarantee the behavior of their proxies to each other. 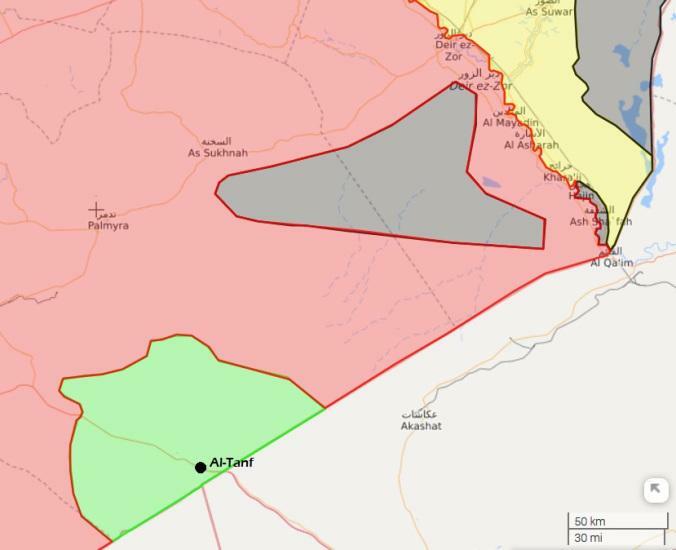 At the same time, however, things are getting complicated in Deir Ezzor where the SAA is now openly probing areas around the U.S. base at Al-Tanf. According to Elijah Magnier thousands of Russian troops are massing in Palmyra as a pressure move to get the U.S. to give up its base at Al-Tanf. Moreover, Russia is not aiming for a partial victory in the Levant now that the useful part of Syria (the most populated geographic area of the country) is liberated, with the exception of the north. This is why the south becomes a necessity that must be liberated. Russia has bigger plans in the Levant: during my visit to the city of Palmyra and its surroundings, the presence of thousands of Russian troops is striking, indicating that Moscow is sending new infantry and special forces in very large numbers. This large presence has not been announced. At the same time there was a major strike on Iraqi PMU forces which killed at least 20 soldiers at the Al Qa’im border crossing (far right of map) that was claimed by the Israelis, but Iraq doesn’t believe that for a second. The U.S. has been very aggressive in defending its position in Deir Ezzor as a bargaining chip in negotiations over Syria’s future and to pressure Iran directly. The problem with that is now that the Kurds, under the SDF, know the U.S. cannot secure an independent future for them came to the bargaining table with the Assad government recently. This is undermining the U.S. position east of the Euphrates. Assad and Putin tried to get the U.S. to give up Al-Tanf in exchange for removing Hezbollah from the Dara’a campaign, but to no avail. So, now it looks like Putin is engaging in a little brinksmanship of his own with those troops in Palmyra to back up the SAA as it pushes against the U.S.-imposed boundary around Al-Tanf (green area). I expect that force is there to contain any desperate counter-attack by recently trained militants by the U.S. at Al-Tanf. And their presence ups the probability that the red line of direct U.S./Russian conflict is crossed. With Assad’s Tiger forces making quick work of the militants in Dara’a the need for Trump to negotiate a settlement for U.S. forces in Syria becomes acute before it spirals out of control. Remember what I always say, the U.S. is only willing to negotiate when it’s losing. The situation in Syria is slowly grinding towards the inevitable conclusion that the U.S. will be pushed out of Syria eventually, both through the active advances of the SAA and its allies and/or the further defection of the U.S.’s allies there, i.e. The SDF Kurds. Turkey has already jumped ship and with Erdogan winning re-election there is little doubt that relations with Turkey will improve after first a coup attempt and then a hybrid war attack on Turkey’s currency and financial infrastructure. Trump needs to walk away with a win from any meeting with Putin and in Syria there is one. He can Declare victory over ISIS in Dara’a and the Southwestern Syrian desert. Negotiating a withdrawal of troops from Al-Tanf is the first part of a deal towards a new multi-party reality which lessens Iran’s future threat to Israel, which is what this is all about now anyway. This Kissinger-esque approach of offering nothing for something will not work since Putin holds all the cards on these issues. The more likely scenario is a Singapore-like agreement to begin draw downs of U.S. troops in Central Asia, including Afghanistan and Iraq, in exchange for a security guarantee from Putin on Iran’s presence in Syria. Eventually that can move towards a new discussion of Iran’s nuclear ambitions. But, make no mistake, Trump has a weak hand here, just like he had with North Korea. It looks like with Russiagate receding he may have enough room to begin playing some cards. Join my more than 120 Patrons on Patreon and see if I have what it takes to help you navigate a world going rapidly mad.